There are many reasons for having a garden. 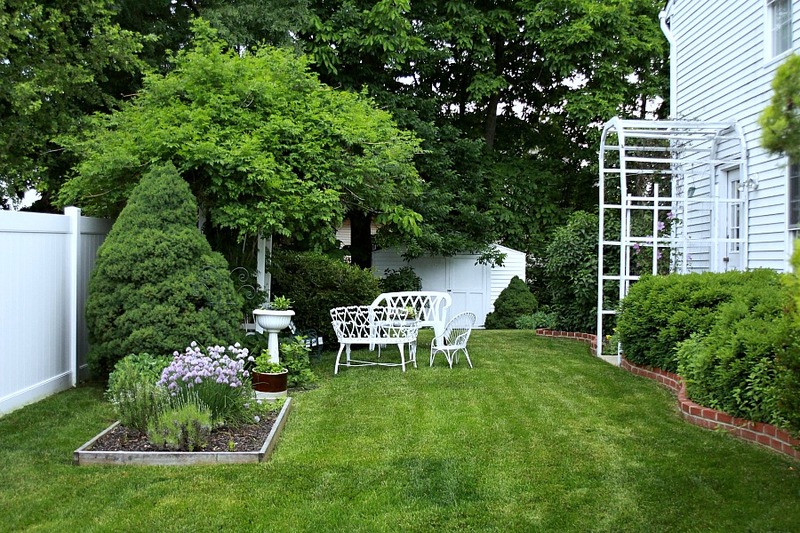 There are many types of gardens depending on your needs, location and enjoyment. I really enjoy keeping a small raised bed for both fun and to provide fresh herbs for cooking. 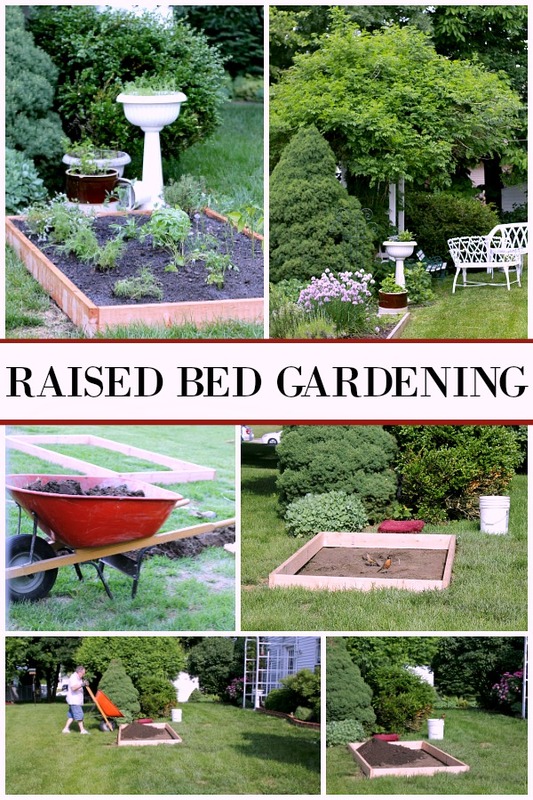 If this interests you too, check out these raised bed gardening tips. If I had the space and the resources, I would have a lovely English herb garden with the intricate sculpted boxwood creating a work of art around a huge variety of herbs and plants. It would fit right in with my formal Georgian or Victorian style home. But since I have neither the home nor the garden, I have a just-right for me, raised bed in which I grow herbs and whatever else catches my fancy. 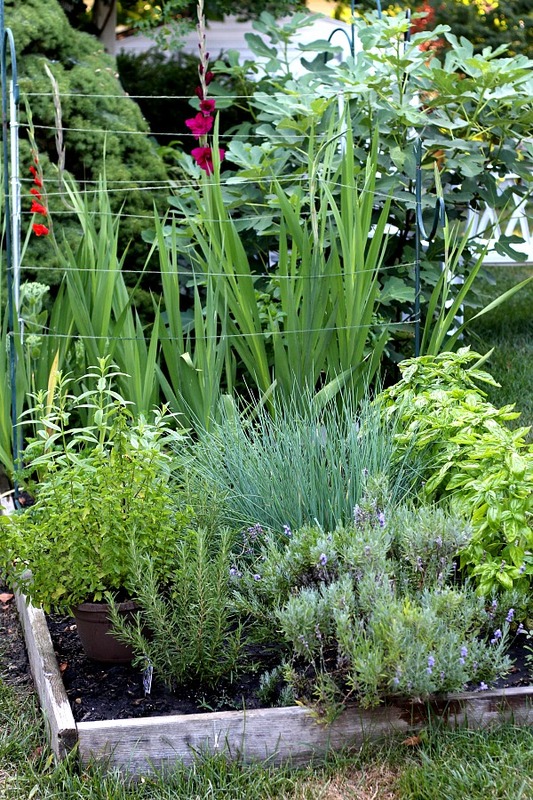 You can grow herbs, veggies, and flowers in a tighter, more nutrient-condensed space. You are able to fill your raised bed(s), with various types of soil to suit the plants you plan to grow you don’t have to deal with trying to amend existing soil. A framed bed gives a well-defined, tidy look to the herb garden and attractive appearance. Choose a location that gets at least six hours of direct sunlight each day. If possible choose a place that is easy to access. Our herb garden raised bed is just a few steps from the door near the kitchen making it easy to snip a few stems when cooking. You can tackle building a raised bed or opt for the easier route and purchase a pre-made frame. The bed can be any size and can be made of wood, stone, brick or cinder blocks. 3 – 2″ x 8″ x 8′ pressure treated* boards. Cut 1 board in half to make the 4′ end pieces. Using 3 bolts (top, middle, bottom) connect one long side to one short side so the bolts are on the outside of the long side. Connect the other short side to the other end of the same long side. Then connect the remaining long side to the 2 ends of the short sides. You will end up with a 4′ x 8′ rectangle. * There are many articles written about concerns using pressure treated wood and its safety. Larry Hodgson of Laidback Gardener discusses the topic. You can do further research by searching the web. Add quality soil and/or compost to the raised bed. Use a rake to level it off so the surface is smooth removing any rocks, large sticks, and other debris. Plant your plants taking care to plant taller plants on the side where they will not shadow to shorter plants. Plant medium-sized plants in the mid-section of the bed and short plants in the front. 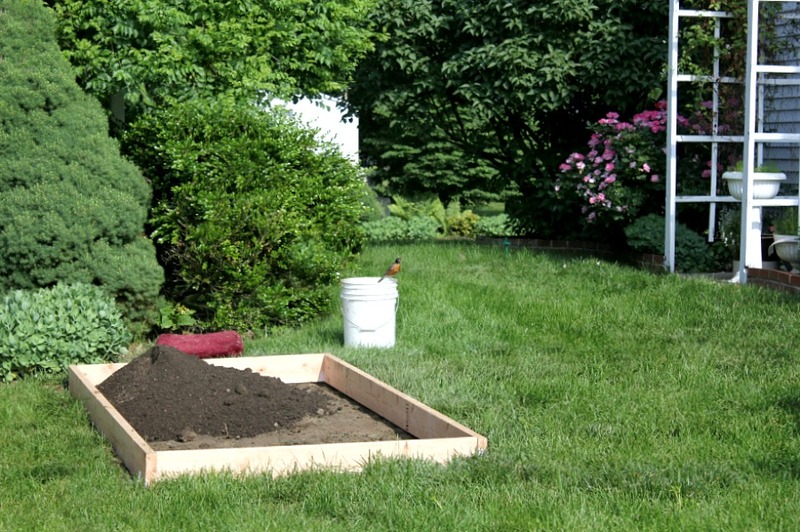 Generously water your new raised garden bed immediately after you are finished planting and keep an eye on them until they are established in their new home. Pinching TIP: To keep your herbs strong, full of flavor and encourage new leaf growth, you will want to pinch the tips back regularly. Just remove a small top portion of each stem every week or so. You do this with a pinching action on the top of the stem. This prevents the plant from producing flowers and going to seed sooner than you would like. Pinching and harvesting do not damage your herb plants. I do not use mulch in my herb garden and work at keeping the weeds out manually. It is a chore but it works for me. You can mulch with straw, grass clippings, leaves, or wood chips after planting your garden. This will reduce the amount of weeding you’ll have to do and keep the soil moist. Let me know if you found something that works for you! 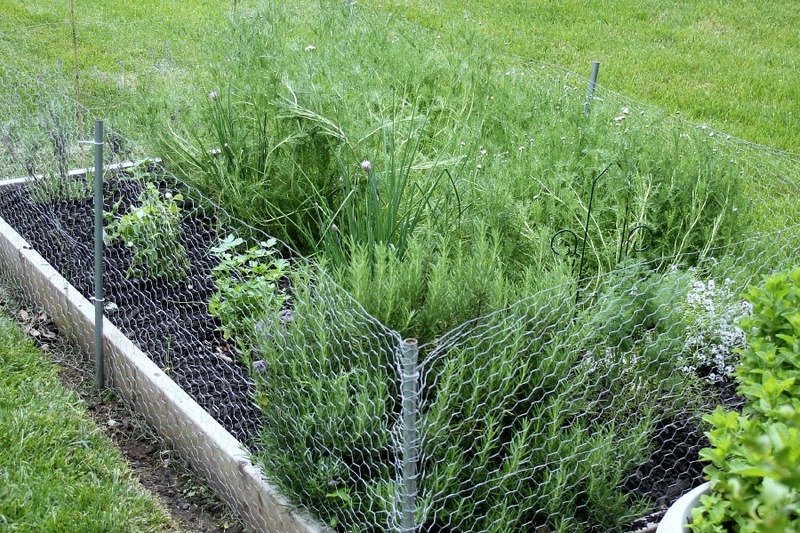 If rabbits are a problem, protect your herb garden with chicken wire. Through they years I have tried many different herbs in my raised bed. I have listed below my favorite and the ones I grow just about every year. I like to keep one side of my raised bed for flowers. 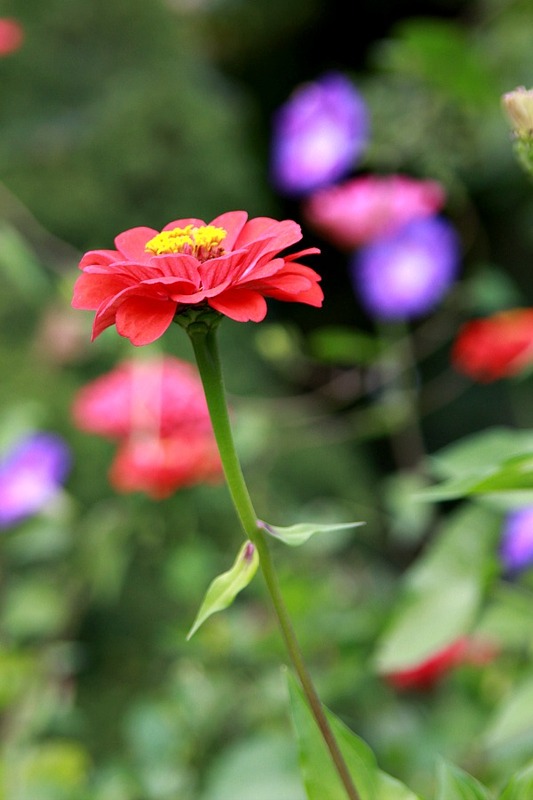 I have really enjoyed growing zinnia as well as Morning Glory there. Early spring I picked up a bag of gladiola bulbs and since it is my birthday month flower, I thought it would be fun to grow them this year. They are just beginning to bloom. Notice the fig tree in the top right of the photo (growing outside of the raised bed). It is in its third season and loaded with figs. We recently noticed and treated for large white fly-type insect and they seem to be gone. Enjoy the fruit, or in this case, the herbs of your labor. The best way to use and enjoy the flavor of herbs is to use them right from the garden immediately before cooking. 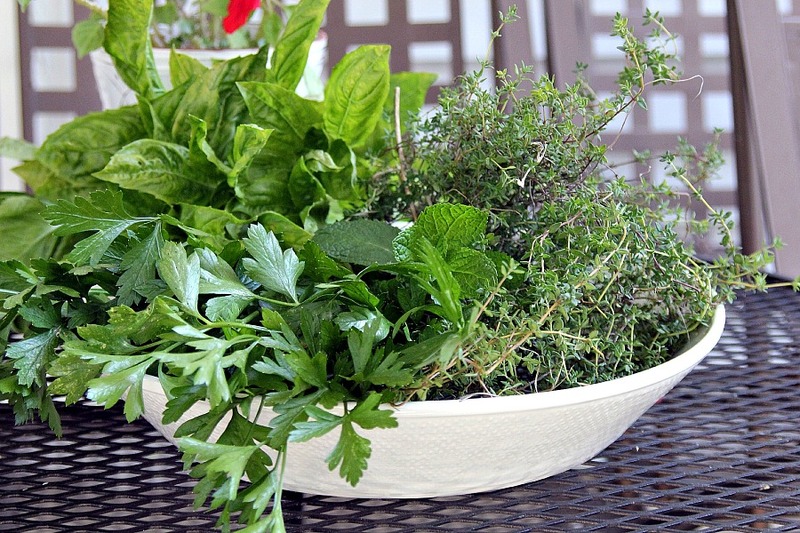 The best time of day to harvest herbs in the morning after any dew has dried off, but before the intense midday sun. 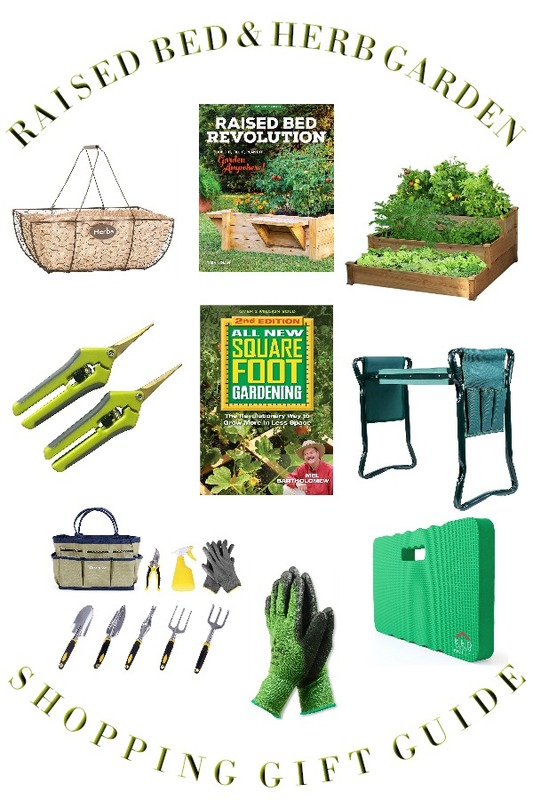 Check out these helpful gardening items. I especially love the garden kneeler and seat. My youngest daughter gave me one as a birthday gift several years ago and my knees are most grateful. Raised beds are a great idea. You have many of the herbs that I enjoy. I do not have good success with zinnias but they make such a pretty cut flower for vases. Oh, and looks like your parsley is attracting lots of caterpillars. Your yard is so very pretty and inviting. 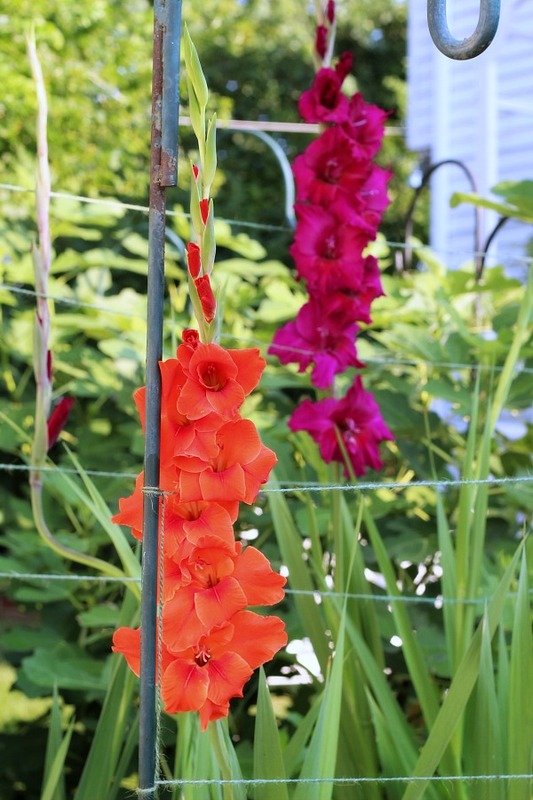 I adore your glads!